I am an Upper West Sider. That basically means that I am a liberal democrat. And liberal I am, but even I have my limits. 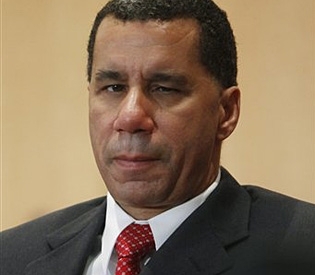 And David Paterson has exceeded them. What is going on in this state? It wasn’t bad enough we had a governor (Elliot Spitzer) who got caught with his pants down with a prostitute (though he did inspire an excellent TV show. The Good Wife. Go Julianna Margulies! ), or that we had a convicted girlfriend beater, Hiram Monserrate, in the NY State Senate. No that wasn’t enough for the past few years. All of these men – all of whom vowed to uphold the law – chose to disregard it. And all of their transgressions involved some sort of exploitation, bullying, or violence towards women. Read more of my rant…and some STAGGERING statistics on violence in NYC by clicking over to NYC Moms Blog. If anyone has been following the apparent take down of Governor Patterson, then this latest coup for this detractors is disguesting. I don’t even live in New York, but of course I read the Times, the Post and the Daily News each and every day. Can his enemies, no, not even his enemies, just people who wanteed him out of the way to push their own agenda, could have acted any more indecent? If this is New York Politics, I am glad I live in the Federal City. What has occurred to Governor Patterson is outrageous. I hope for the People of New York, it was worth it to the victors off the spoils. Governor Paterson, you are well out of it. Let them fall on their faces. Get yourself together, take a break and watch their karma come back to haunt them. This was ridiculous. Hold your head up proudly as you make your exit. I’ll bet you Governor Patterson’s phone is ringing off the hook with the “I’m sorry, and is there anything I can do to help you” Ugh! POWER & PEOPLE! They make me sick! Why couldn’t he have run and then just legitmately lost the election. Afterall it is up to the New Yorkers am I right? If he were so terrible, why was he run out of office in this underhanded way.